Hello, it's Gloria with you today. 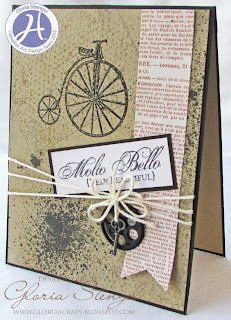 I have a grungy, collage card to share. 1. Make a black, top fold card 5 1/2 x 4 1/4 inches. 2. Trim kraft cardstock 5 3/8 x 4 1/8 inches. 3. Spray with Almost Black and Cork spray mist. Allow to dry or use a heat gun to speed up dry time. 4. Stamp Distress Background in White Frost pigment ink on the upper left and lower right corners of the kraft cardstock. 5. Emboss with a clear embossing powder. 6. 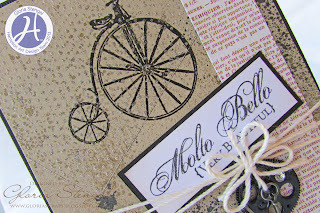 Stamp bicycle image from the Vintage Bicycle stamp set in Black archival or pigment ink as shown, overlapping the distress background image. Emboss with clear embossing powder. 7. Trim a strip of text designer paper to 5 x 1 inches and trim the bottom edge into a banner or flag shape with scissors. Staple to the right edge of the kraft cardstock. 8. Wrap cream twine around the card as shown. 9. Attach the kraft panel to the card front. 10. Attach a gear and a key charm to twine and glue to the card as shown. 11. 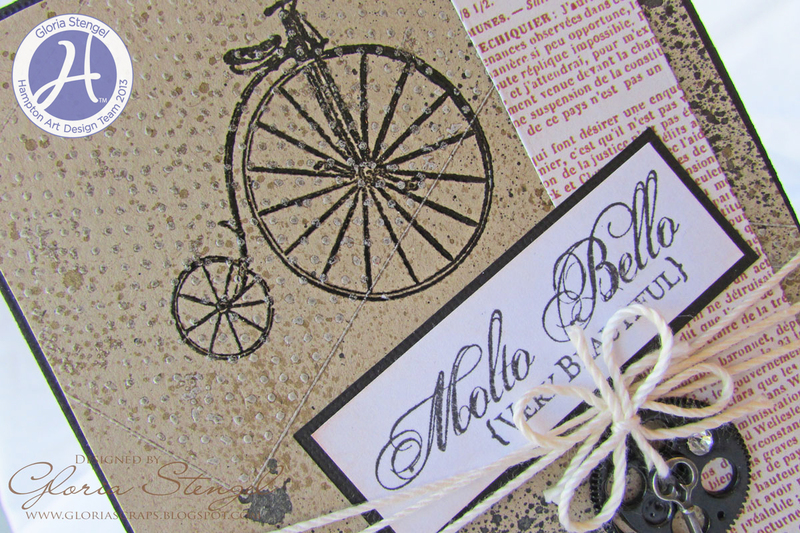 Stamp the Molto Bello sentiment from the Very Beautiful stamp set onto white cardstock with Black archival ink. Trim into a rectangle shape. Using a foam or sponge ink applicator, ink over the sentiment with pale brown dye ink. Mat sentiment with black cardstock. Attach to the card front as shown. 12. 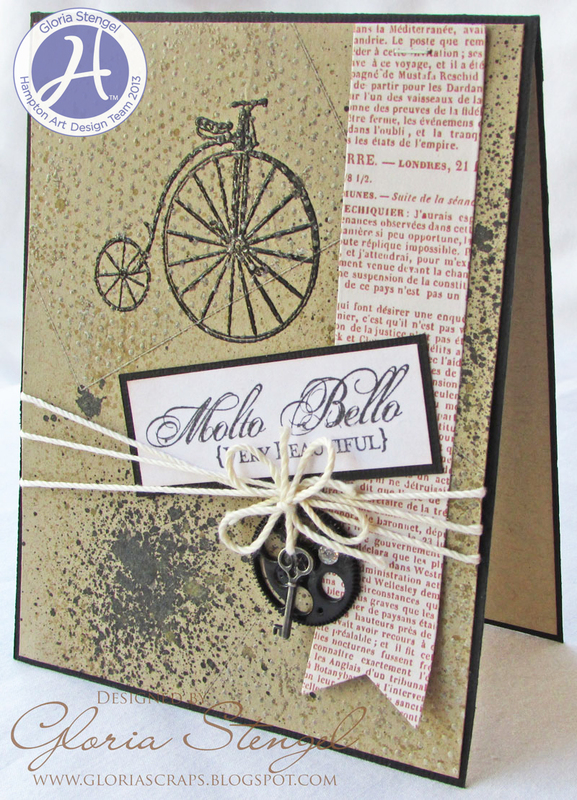 Add kraft cardstock to the inside of the card. I've added this card to my Pinterest board ... SO VERY LOVELY!! !